New Albany public service crews are responsible for the general oversight of annual roadway maintenance, to keep our roadways clean and in good working condition. Crews average 700-800 pothole repairs and redress 10 miles of roadway berm annually while maintaining more than 236 lane miles of roadway. 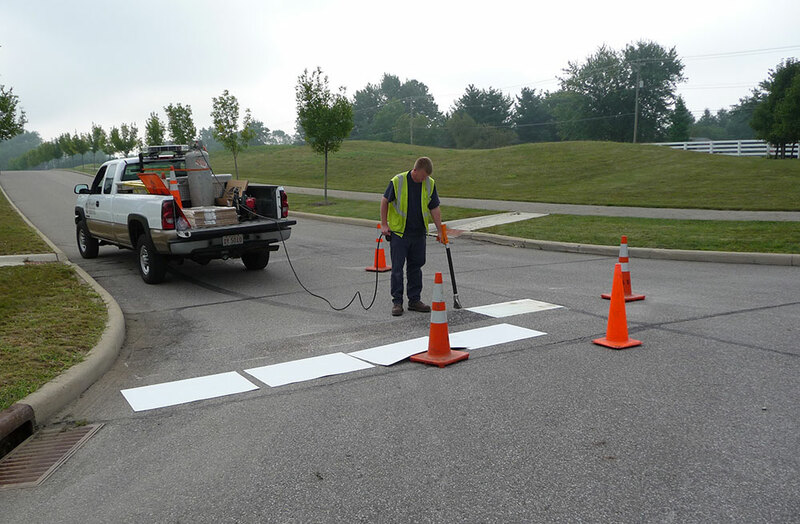 Crews also maintain pavement markings, including stop bars and crosswalk lines. 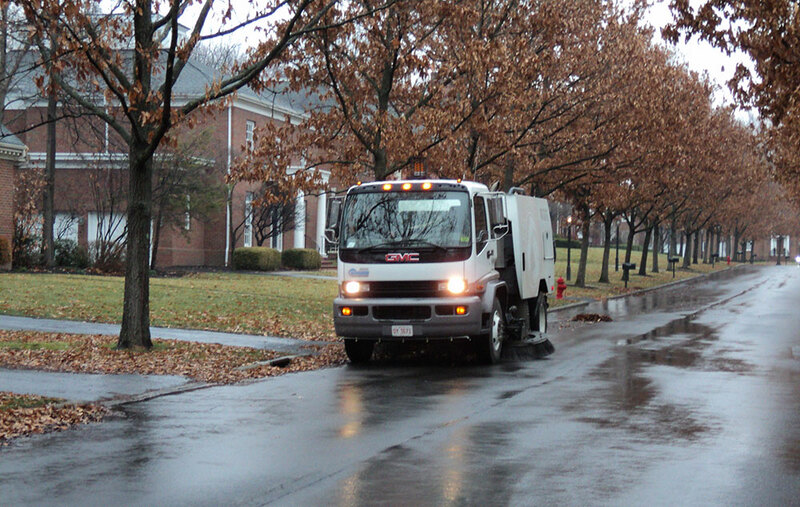 Street cleaning removes dirt, debris and other hazards from the road and storm sewer systems. It promotes the health, safety and appearance of our community. The Environmental Protection Agency considers street sweeping a best management practice in protecting water quality. Modern street sweepers are equipped with water tanks and sprayers used to loosen particles and reduce dust. The brooms gather debris into a containment box that glides over the pavement. This debris is vacuumed through a tube and dumped into a collection hopper. New Albany roadways are routinely swept once a month as warm seasonal weather permits. In a given year, city crews collect more than 105 tons of sediment and debris found along the curbed streets to keep our streets neat and tidy. Street lights provide increased visibility at residential intersections and along commercial roadways for drivers traveling at night or during inclement weather. City crews perform monthly inspections to identify inoperable lights for repair. A well maintained street lamp and pole should last for more than 35 years. Repainting of street lights occurs annually and requires the use of specialized aerial lift equipment. Approximately ten percent of the city’s street light inventory is repainted annually. These electronic signaling devices are positioned at road intersections, pedestrian crossings and other locations to control competing flows of traffic. Traffic signals assign the right of way to road users through the use of lights in standard colors (red – yellow – green). Traffic technicians annually respond to equipment malfunction, replace defective parts and make adjustments to signal timing. This responsibility covers more than 220 signaling devices located at 18 different intersections within city limits. To meet green initiatives as established by the city, technicians are in the process of converting incandescent traffic signal lights to LED style bulbs. Traffic signs and street name signs are critical elements of the roadway system. They communicate the rules, warnings, guidance and other important information that drivers need to safely and efficiently navigate roads and streets. Well maintained signs and sign placement are essential to help drivers make good decisions. New Albany’s Public Service Department maintains roadsides along highways and arterial collectors within city limits. This consists of mowing grass from the edge of the road to the ditch line or city right-of-way line. Mowing crews are also responsible for trimming grass and vegetation around guardrails, bridges and traffic signs. Routine mowing maintains the community’s appearance, provides positive drainage and reduces animal and insect habitation along the road. The amount of mowing required each year depends heavily on the weather and the quantity of rainfall. The city utilizes in-house staff and contracts with landscape vendors to maintain the turf and vegetation along designated Village Center streets and rural roadsides. The purpose of installing a “wye” is to re-direct the sump pump underground to a French (gravel) Drain so water does not pond in the roadway. The water filters through the gravel bed to an existing perforated pipe located under the curb and eventually to the New Albany storm sewer system. If you spot trash or dead animals along the roadside or in the roadway, please contact the New Albany Public Service Department at 614-855-0076 or complete the form below. Crews do not collect trash or dead animals on private property. New Albany streets are excellent, but crews still fill about 700 potholes annually.